I'll preface this review by saying that I don't really read children's books. I'm a single guy, in my twenties, and have no real reason to pick up a children's book. As part of my blog, I receive various requests to review books, many of which I simply don't have time to read and review. When I was contacted about reading Candy and the Cankersaur by author Jason Sandberg, I figured I would at least be able to read the book quickly. And so I agreed, read the book in a few minutes, and my review is as follows. The story is of a young girl, Candy, who lives in a large mansion. She has lots of toys, which she generously shares with other, and lives a seemingly normal life. But beyond the toys and material objects, Candy mostly desires more attention from her rich, busy father. As fathers often do in these types of stories, Candy's dad tries to occupy the void in his daughter's life with more stuff. In this instance, he buys her a rare dinosaur, Cankersaurus Rex. Despite her initial fear of the creature, Candy trains the dinosaur, nicknamed Cank, to be a pretty good pet. When Candy's neighbor Chucky see's the animal, he is immediately filled with jealousy. He has a longstanding rivalry with Candy, and realizes that his parents will never be able to top the gift of Candy's father. He decides that if he can't have a pet dinosaur, then neither can Candy. Chucky proceeds to steel Cank and sell him to the circus. As all good children's books must, this story does end with a happy ending. Chucky sees how Cank's disappearance makes Candy sad, and realizes his mistake. The two then enlist the help of Candy's dad, who realizes his own paternal mistakes, to help bring Cank home. Despite not having any real authority on the genre, I do feel that children, especially younger ones will enjoy this book. Even better, the adults who read it to them won't feel tortured while reading it! As far as a kid's book is concerned, this one has every element that is needed to keep a child's attention. The bright pictures, reminiscent of those by cartoonist Syd Hoff (do a quick search of his name and see if nostalgia doesn't kick in), are both visually vibrant and a great visual aid to the words. The text is large and easy to read. Better still, the story teaches a lesson about the intangible things in life that are more important than material possessions. And finally, there is a dinosaur! What six-year-old boy doesn't like dinosaurs? Overall, this is a quick read that both kids and parents should enjoy. 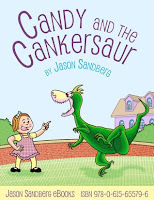 This entry was posted on Tuesday, September 17, 2013 and is filed under Book Review,Candy and the Cankersaur,Children's Book,Dinosaur,Jason Sandberg,Picture Book. You can follow any responses to this entry through the RSS 2.0. You can leave a response.